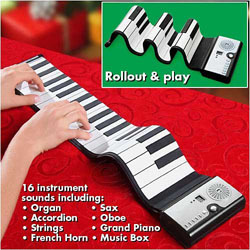 Cordless roll-up piano for playing anywhere!Be the life of any party withour portable, lightweight baby grand. Rubber piano reaches three full octaves. With your help we can reach more people and let them know about Roll up Piano whether this product works or not. I bought this for my 12 year old daughter, and it only worked for about a few weeks, then it just stopped all together! Don't waste your time or money like I did. This is just junk. Absolutely junk. Hardly even worked half the time, some of the keys were not even working.